Photo credit: James Ferrara Photography. Wethersfield, Conn. (July 29, 2014) –It is unlikely Benjamin Franklin ever visited the Wethersfield home of his friend and colleague, Silas Deane, during the Revolutionary War. But, on Thursday, October 9, 2014, at 6:30 p.m., Franklin will stop at Deane’s residence—albeit a little late. 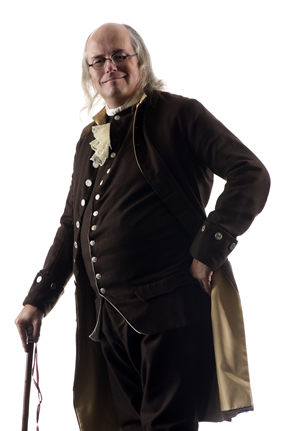 As portrayed by historical re-enactor Jack Sherry—in full colonial dress—Franklin will dispel some historical myths, share his characteristic humor, and discuss lesser-known aspects of his life with the public during “A Visit with Ben Franklin,” in the barn at the Webb-Deane-Stevens Museum, 211 Main St., Wethersfield. The free presentation will be preceded by a wine reception (by donation) at 6 p.m.
One of America’s most admired historical figures, Franklin was a true Renaissance man. World-renowned in his own lifetime and ever since, he was a printer, publisher, editor, inventor, and diplomat, among other things. A prolific writer with a scathing wit, his pseudonyms included Alice Addertongue, Busy Body, Caelia Shortface and Martha Careful. At the age of 16, Franklin wrote letters to his brother’s newspaper pretending to be a sharp-witted widow named Silence Dogood, covering topics ranging from love and courtship to the state of education in Massachusetts. Wildly popular with readers, Miss Dogood received several marriage proposals during her brief period of public commentary. Franklin was also politically savvy, as was his close friend Silas Deane. A member of the Second Continental Congress, Franklin helped to draft the Declaration of Independence. In 1776, he signed the Declaration, and afterward sailed to France as an ambassador to the Court of Louis XVI. That same year, Deane, our nation’s first diplomat, shared lodgings with Franklin—who arrived in France later—and signed the treaties of alliance and commerce negotiated with France, the first country to recognize the United States as an independent nation. When not performing as Ben Franklin, Jack Sherry teaches American history at a private school in northern New Jersey. He has been actively involved with living history re-enacting since 1980, portraying the common Loyalist soldier who fought during the American Revolution, 1775-1783. He resides in West Nyack, New York. Located in the heart of Connecticut’s largest historic district, the Webb-Deane-Stevens Museum provides the quintessential New England experience – from the American Revolution to the early 20th century. Tours include the 1752 Joseph Webb House, where General George Washington met with French General Rochambeau and planned the military campaign leading to the end of the Revolutionary War, the 1770 Silas Deane House, built for America’s first diplomat to France, and the 1788 Isaac Stevens House, which depicts Connecticut life in the 18th and 19th centuries. For more information visit: www.webb-deane-stevens.org or call(860) 529-0612. Like us on Facebook: https://www.facebook.com/WDSMUSEUM.